New FCC rules for the Personal Radio Services are in effect as of 28 September 2017. The new rules permit higher powers for FRS radios and more shared channels between FRS and GMRS. The old rules restricted the shared FRS/GMRS channels 1-7 to 0.5 watt. The new rules permit 2 watts. Furthermore, channels 15-22 also allow 2 watts. By way of contrast, GMRS radios may operate at 5 watts on channels 1-7 and 50 watts on channels 15-22 or on repeaters. The combination FRS/GMRS radios will be phased out by late 2019 in favor of FRS or GMRS only radios. Thus far there are some good and relatively inexpensive GMRS radios on the market. Dedicated FRS radios will probably start appearing in 2018. Lastly, any existing combination radio that exceeds 2 watts on any channel will require the operator to have a GMRS license. Sound confusing? The situation is not helped by the fact that most of the FRS/GMRS user manuals don't have any power figures. They only have the relatively useless (and grossly inflated) range figures. A person can find the output power of any radio by digging into the FCC test documentation but that can require a considerable amount of effort. However, the folks at Buy Two Way Radios have made the process easier by providing a chart that lets you know if your radio will remain legal for license-free use. See Which FRS GMRS Radios are License Free? The above information still doesn't answer the question of which radios have the most legal power. With few exceptions you won't find that information in the manuals or other manufacturer documentation. You have to research the FCC test data to get a real answer. The trick is to get the radio's FCC ID. If you have a radio, check the label on the back or inside the battery compartment and you will find the FCC ID. For example, the Uniden GMR5095-2CKHS has the ID AMWON5095. If you go to http://fccid.io/AMWON5095 you will get a summary along with a collection of test reports and other information. This radio is 0.44 watts on the FRS channels and 1.9 watts on channels 15-22. Those figures are near the legal limit and make this radio an excellent candidate for unlicensed use. Some other codes include Midland (MMA) and Cobra (BBO) and Motorola (AZ4). No, it's only part of the equation for getting the most range. From a radio design standpoint, a poor antenna or a receiver that lacks sensitivity will compromise performance. Also, poor operating practice will also limit your range. Be sure to keep the antenna vertical and try to operate away from heavy foliage. If conditions are poor, try finding higher ground. Sometimes moving just a few feet will get you away from a "dead spot." A GMRS license requires that you complete FCC form 159 and form 605. These forms can be found on the FCC Forms Page. The license costs $70, is valid for 10 years and covers the licensee's spouse, children, grandchildren, stepchildren, parents, grandparents, stepparents, brothers, sisters, aunts, uncles, nieces, nephews, and in-laws. When purchasing a FRS radio, be sure that it has channels 1-7 and 15-22. These are the channels that are shared with GMRS. Most of the available FRS/GMRS radios have power levels that are significantly below the new legal limits. However, the Uniden GMR5095-2CKHS (shown to the left) is and will remain fully legal at the maximum allowed power. The tested output is 0.44 watts for FRS low power and 1.9 watts on high power (channels 1-7, 15-22). This radio is also waterproof and submersible so it's ideal for general outdoors and sports use. A pair of radios with accessories may be purchased from buytwowayradios.com for about $115 + postage. Another good selection is the Motorola TalkAbout T460. High power is slightly less than that of the Uniden (1.7 vs 1.9 watts), FRS is essentially the same. The FCC page for this radio is at https://fccid.io/AZ489FT4924 . Price for a pair of radios is about $80 + postage. Two companies are currenly supplying hand held GMRS radios. The first is BTECH with their GMRS-V1 (approximately $55 each) and Tera with their TR-505 ($100-$120 depending upon programming options). The TERA is a dual service radio with the 5 MURS channels as well as GMRS. It is limited to a total of 16 channels so you have to be selective in your programming choices. Both of these radios have 5 watts of power and the antennas are removable. They are repeater capable. The BTECH can be obtained from Amazon. A good source for the Tera is Better Safe Radio. They have many options for programming your radio. With either of the above radios you can increase your range by adding a more efficient antenna. One good and simple to use option is the so-called "roll-up j-pole." 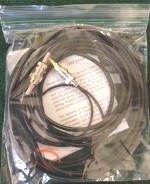 The example shown above includes the antenna, a length of extension cable and some adapters for use with different radios. Simply hang the antenna from a tree limb, fishing pole, or similar and you are in business. This antenna is supplied as shown by Prof. Ed Fong. His graduate students make these to providing funding for projects. To purchase, do a search on ebay for Fong DBJ-2 antenna or purchase from Better Safe Radio. The price is about $35. Be sure to ask for the GMRS/MURS version, not the ham version. There is also a DBJ-1 base station antenna that is supplied as a kit for about the same price. You have to purchase a length of 3/4-inch PVC pipe to make the enclosure. This saves on shipping fees. Midland manufactures a new line of GMRS mobile radios. For ease of use, an excellent option is the MXT115 pictured at the left. It has a rated power of 15 watts and comes with a magnetic mount roof antenna. It can also be used with the Ed Fong antenna (with a UHF to BNC adapter). It comes with a power cord and plug that connects to your car's accessory socket (aka cigarette lighter socket). For home use, the radio can be powered with a 12 volt rechargeable battery or something like a Black & Decker or Stanley portable power source. Midland also has a 40 watt radio, the MXT400. This is an excellent GMRS radio but it will require more in the way of a power supply. The low end model, MXT105, is not repeater capable and only has a 5 watt output. The Midland radios may be purchased from buytwowayradios.com or Amazon.